President's Message: Northeast Leaders Conf. March came in like a lion and hopefully it will go out like a lamb and April will be warm and sunny. By the time you read this article the Northeast Leaders Conference “Leading Leaders 2.0” will be just a memory for those who attended. I hope that everyone who attended was able to get something out of this conference to bring back to their Granges. I will have more on the Conference in the May President’s Report. One of our speakers during the conference was Erin Yelland, Ph.D., CFLE; Assistant Professor and Extension Specialist from Kansas State University. Erin’s topic was: “The Opioid Crisis: What You Need to Know.” The opioid crisis is not just an inner-city problem but rural areas experience it as well. Drug overdose is the leading cause of accidental death in the United States, of which a large majority is due to prescription and illegal opioids. At our last Board meeting we discussed ways we could set up programs for the State Grange and our communities to participate in a program. One of the programs is to pass out disposable bags that you put in your unwanted prescriptions; add water, seal and dispose of in your garbage. We will be looking into these programs and see what we can set up in our state. I felt this was a good conference with plenty of information on our Youth and Junior Committees, Membership and Communication Directors. At our last meeting, the Board of Directors decided to sell the property at 43 Naubuc Avenue in Glastonbury, the former Good Will Grange Hall. 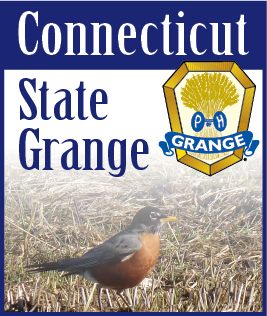 We are looking into renting a space for our Connecticut State Grange office. There are chairs, tables, sashes, regalia of all kinds and much more looking for a new home. If your Grange needs any of these items, please contact Todd or myself and we can make arrangements for you to pick them up at the Grange Hall in Glastonbury.